A steady stream of news articles announce: “Desertification affects (insert fraction) of (insert country)”. A photograph of a sand-engulfed house, dry riverbed, dead animal, or close-up of cracked earth accompanies the story. Environmental catastrophes make for interesting reading. But it is seldom clear what ecological phenomena the term “desertification” actually refers to, and therefore what the solution might be. And it’s the solution that matters. Desertification is a poorly-defined catch-all for land degradation occurring in “drylands” featuring relatively arid climates. The imprecision produces assessments of desertification extent that range from 4-74% of global drylands1. Nonetheless, the term “desertification” has international standing via the United Nations Convention to Combat Desertification (UNCCD). The UNCCD has been ratified by 195 countries plus the European Union—a remarkable level of acceptance for a vague ecological concept. For countries afflicted with desertification there are also direct benefits in the form of support for international development assistance1. “reduction or loss in arid, semi-arid, and dry sub-humid areas, of the biological or economic productivity and complexity of rain-fed cropland, irrigated cropland, or range, pasture, forest, and woodlands resulting from land uses or from a process or combination of processes, including processes arising from human activities and habitation patterns, such as: (i) soil erosion caused by wind and/or water; (ii) deterioration of the physical, chemical, and biological or economic properties of soil; and (iii) long-term loss of natural vegetation”. Even among my close colleagues, we disagree about what desertification should mean. The primary problems with the UNCCD definition are rooted in 1) reference conditions and 2) reversibility of change. Assessing desertification requires a comparison to a non-degraded, reference condition. Establishing the latter can fall prey to errors and deliberate manipulation. The characteristics of a historical state can be misrepresented by asserting that an area used to be highly productive based on dubious historical accounts, when in fact it featured low and variable productivity similar to the current “desertified state” (e.g. it is a natural desert). This tactic was used by the 19th century French to justify the need to restore Algeria (and to colonize it in so doing)2. Even when there is adequate evidence for ecological change, historical conditions existed in the context of larger-scale and longer-term change such that a return to them may no longer be possible. Desertification should also be “long-term”, but it is often not clear how long that time period should be. Persistent absence of vegetation can be caused by continued land use pressure or time lags in recovery, yet recovery can be rapid under the right conditions. The recent rapid greening of the Sahel, for example, begs the question of whether it should have been called desertified in the first place3. 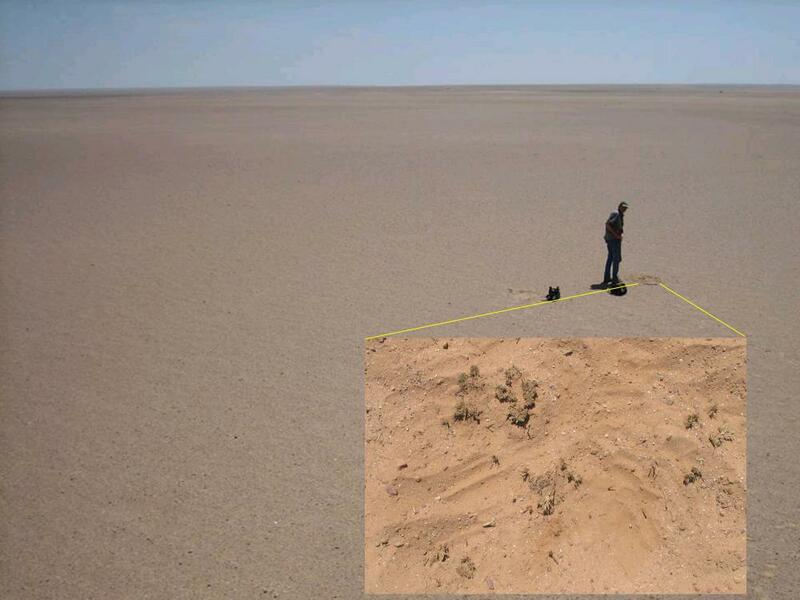 Areas that look to be desertified in southern Mongolia in fact harbor an abundance of living plants—buried beneath a thin veneer of sand in dry periods (see Figure). On the other hand, narrowing desertification to only relatively recent and difficult-to-reverse change (such as soil loss) might limit recognition of cases where change can be reversed with policy and financial support. This is particularly critical where interventions can prevent further degradation resulting in permanent change. Thus, desertification may most usefully be described as a trend toward or vulnerability to persistent change, rather than as a persistently altered ecological state. For these reasons, scientists and the media should focus on the specifics of ecological state change when reporting about desertification. Foremost, there should be a critical appraisal of reference or expected conditions. Coping with an extended dry period in a desert is a serious challenge, but such periods are expected and mitigation should be planned for. It is equally important to recognize that there are vastly different kinds of state change that are important in drylands, including shifts in plant species with loss of valued forage plants (so-called “green desertification”), encroachment of long-lived woody or invasive plants, changes to soil structure that reduce productivity, and loss of soil leading to collapse of productivity (what some regard as ‘true desertification’). The causes and persistence of these changes vary, and knowing these details is critical for implementing effective technical and policy responses. If we do not recognize the nature of the problem, management actions can waste resources, miss opportunities to prevent undesirable change, or make conditions worse. “Desertification” is as good as we’ve got for capturing interest about the challenges faced in world’s drylands, the neglected home to over 2 billion of us. But the next time you read a news piece or a journal paper with the word desertification in the title, take a closer look before you visualize a wall of sand. Ask yourself what is really going on. Then you might visualize a solution. 1. Safriel, U. N. 2007. The assessment of global trends in land degradation. Pages 1-38 in M. V. K. Sivakumar and N. Ndiang’ui, editors. Climate and Land Degradation. Springer Berlin Heidelberg. 2. Davis, D. K. 2007. Resurrecting the granary of Rome: Environmental history and French colonial expansion in North Africa. Ohio University Press. 3. Dardel, C., L. Kergoat, P. Hiernaux, E. Mougin, M. Grippa, and C. J. Tucker. 2014. Re-greening Sahel: 30 years of remote sensing data and field observations (Mali, Niger). Remote sensing of environment 140:350-364.